Aaron Paterson performs for world leader in the Cosmetics industry, Revlon Canada Inc and has their employee’s “entranced and delighted”, receiving a standing ovation for his performance. 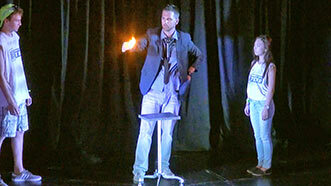 "We were all entranced & delighted with Aaron Paterson’s Magic show. The show elicited smiles, laughter & admiration as it brought out the child in each of us. It truly delivered on the joyful spirit of the Season. Thank you! " 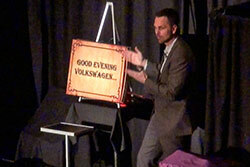 One of the world’s largest companies, Volkswagen Group brought Aaron Paterson in for their recent all employee meeting and he presented an "exceptional and tailored show” receiving a standing ovation for his performance from the over 300 employees in attendance. One of Canada’s best managed companies, Napoleon retains the services of one of Canada’s premiere event entertainers and the results are “mind-blowing”. Aaron Paterson puts Guelph Hydro “under his spell” in Ontario with his clean, corporate entertainment and receives a standing ovation for his performance. "Aaron Paterson has a certain way of putting you under his spell. 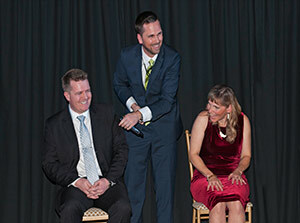 Aaron's mix of magic and hypnosis had all our employees from different age groups laughing and applauding all night long. 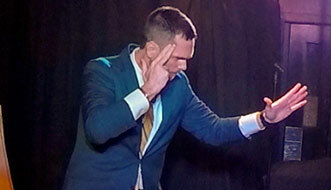 He reinvents comedy hypnosis and delivers an energizing evening of magic and amazement." 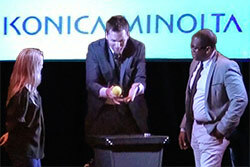 Konica Minolta retains the services of one of Canada's leading corporate entertainers, Aaron Paterson for their key sales kick-off and Aaron "delivers", receiving a standing ovation for his presentation. Director of Sales, Central Market. 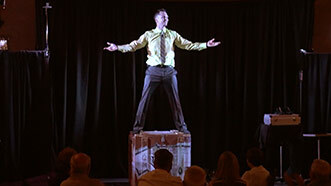 Carlton Cards retains the services of one of Canada’s top corporate entertainers to entertain at their recent employee luncheon and the event is a resounding success! "I had nothing but fantastic feedback about your work today. Thank you so much for your performance. The folks here are still trying to figure out how you did the magic! You helped make my lunch a great success and I really appreciate it. I have some folks that have asked for your contact info so I hope you don't mind if I pass it along." 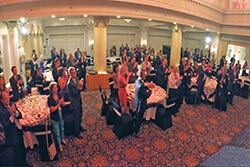 Allied Pharmacists Inc. recently sought out Aaron Paterson due to his stellar track record in providing high quality Corporate Entertainment in Ontario and all over Canada, and Aaron receives an enthusiastic standing ovation from the many Pharmaceutical industry delegates in attendance. Aaron Paterson can now count the two most prominent pharmaceutical advocacy groups in Ontario as satisfied client’s. 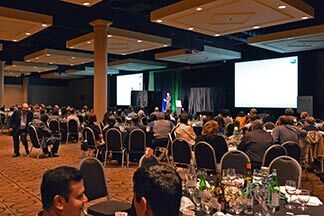 API (Allied Pharmacists Inc.) recently held a conference for its members and in order to show appreciation for their loyalty, provided some very special entertainment to headline their gala evening. One of their board members had seen Aaron perform at Deerhurst Resort for OnPharm (the other most prominent pharmaceutical advocacy group in Ontario) and as a result had no hesitation in immediately retaining his services for their turn-key event. 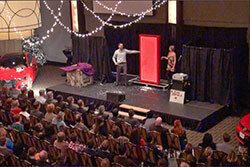 The event took place at Ontario’s Congress centre with Aaron taking the stage at around 10pm and performing a 75 minute presentation in which he made a lady levitate in mid-air, caused attendees watches to vanish from their wrists, and taught the audience of over 300 Pharmacists how to achieve the impossible, which was an incredible metaphor for business success. The guests were so enthused with Aaron’s performance that they showed there appreciation with an enthusiastic standing ovation. The Congress Centre was a wonderful venue for the event and was very accommodating in providing AV support for such a large performance. Aaron looks forward to working with API on future events. 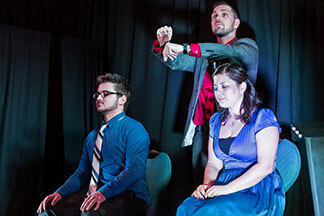 Aaron Paterson performs Corporate Entertainment in Ontario for the University of Ottawa’s, Telfer School of Management, at the Alumni Theatre and receives a standing ovation for his performance. When the University of Ottawa’s Telfer School of Management was looking to exceed the success of their previous annual event, they contacted Aaron Paterson Magic. Aaron was chosen from among many other entertainers due to his track record for success. 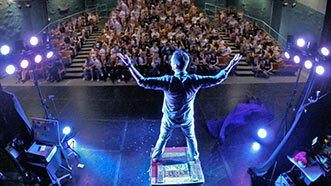 Students were treated to some of Aaron’s most innovative and visually stunning illusions and comedy and he received an immediate standing ovation following his performance, solidifying Aaron’s abilities to customize performances for any age range or demographic. The alumni theatre staff were a pleasure to work with and incredibly accommodating, helping to facilitate a sophisticated performance with so many moving parts. Aaron looks forward to working with the Telfer School of Management on future events. 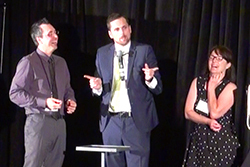 Aaron Paterson performs Corporate Entertainment in Ontario at the King Edward Hotel for Aon Hewitt and receives two consecutive standing ovations. Aaron Paterson was chosen from among many other keynote presenters to entertain at Aon Hewitt's recent conference that took place at the historical King Edward hotel in Toronto. He was hand picked by the executive team of Aon Hewitt, a world leader in the human capital and management consulting industry. 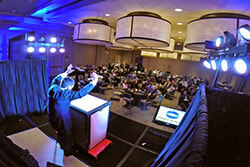 Specializing in versatile, customized presentations, Aaron was able to captivate conference goers with a 1 hour performance. 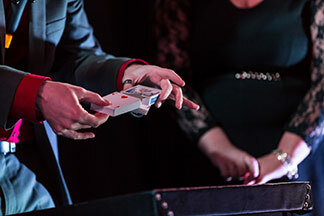 Guests became the stars of the performance as they participated in some of the most cutting edge magic, mentalism and illusion being presented on stage today. 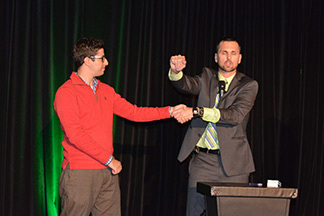 By Incorporating key messages from the conference directly into the performance, Aaron was able to create a presentation that was relevant to the group of Aon Hewitt employees. To close the performance Aaron made a woman levitate 7 feet in the air on the open stage, audible gasps could be heard from the captivated audience. 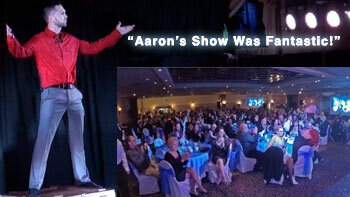 Attendees showed their appreciation for the performance by giving Aaron two consecutive standing ovations. Corporate Entertainment Ontario at its best! 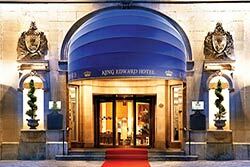 The King Edward hotel was very accommodating to work with which aided in making the performance the huge success that it was. Aaron would like to extend a thank you to Aon Hewitt for choosing his services and being such a pleasure to work for. Aaron hopes for the opportunity to work with the company on key future events. 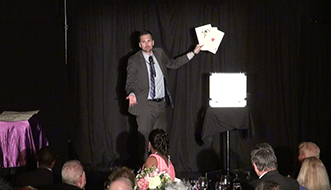 Magician and Illusionist Aaron Paterson Performs for the Black Tie, CGA of Ontario Past Chairs dinner at the Ritz Carlton to rave reviews from those in attendance. When CGA was looking for entertainment for one of their most prestigious events they knew they could rely on Aaron Paterson to customize a presentation specifically for a crowd that is known for being very discerning. The results were just what the executive at CGA had in mind and the audience raved about the performance following the event. The CEO commented that Aaron hit another one out of the park being that this was Aaron’s fourth event entertaining for various branches of CGA. 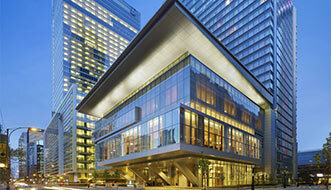 The Ritz Carlton was a pleasure to work with from start to finish. 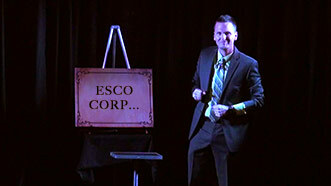 Aaron Paterson performs in Port Hope for Esco Corp at their 20 year employee event and the evening is a "huge success”. Past client of Aaron Paterson Magic, Esco Corp, recently brought him back to headline their key 20 year employee and retiree event that took place in the lovely Port Hope, Ontario. 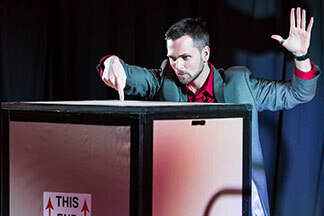 Aaron was able to provide entertainment that included something for everyone featuring comedy, magic, audience involvement and illusion. 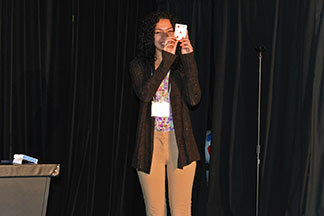 As result of the performance, Esco deemed the event a huge success. Attendees were recognized by Esco for various milestones including long standing employment with the company and retirees were honoured for their years of service to the company. Aaron was honoured to have been asked to be the entertainment for such a key event and looks forward to working with them again on future events. 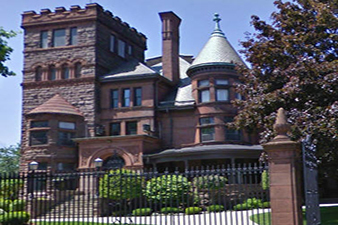 Aaron Performs corporate entertainment at the historic Scottish Rite building in Hamilton, Ontario to commemorate the 50th anniversary of the Trafalgar Masonic Lodge and receives a standing ovation. 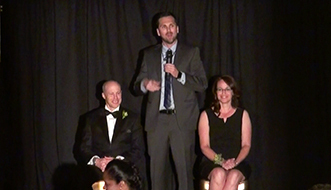 When the Trafalgar Masonic Lodge was looking for first class entertainment for their Golden Anniversary celebration that took place at the Scottish rite building in Hamilton, Ontario, they approached Aaron Paterson. 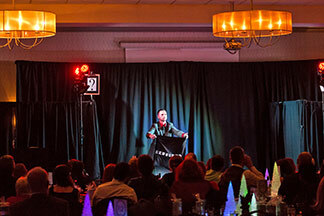 Guests were treated to a hilarious performance filled with comedy, magic and illusion. The lodge was thrilled that Aaron was able to incorporate their fiftieth anniversary into his performance as well as to include their special guests attending from Battlefield lodge (an affiliate lodge). Aaron pulled out all of the stops in order to make this an extra special performance and the lodge and guests showed their appreciation with an enthusiastic standing ovation. 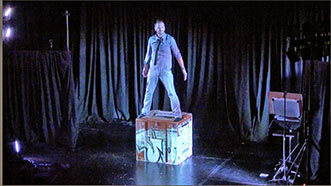 Included in the performance were various signature pieces from Aaron’s professional repertoire featuring an escape effect from a large packing crate, the appearance of a large snowstorm on the stage and the thoughts of attendees being read as if by Extra Sensory Perception. The historic Scottish Rite building played host to the event and was a pleasure to work with on achieving such a successful evening. 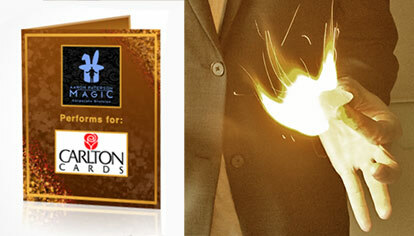 Corporate Entertainment Hamilton at its best! Aaron Paterson was honoured to perform for the Gala evening in support of Down Syndrome Awareness, receiving a standing ovation for his performance. 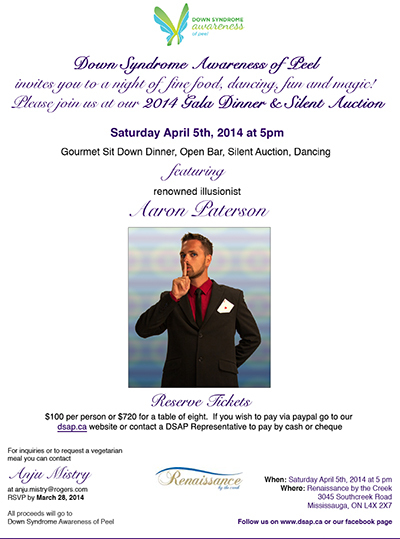 Aaron Paterson was recently chosen as the headlining corporate entertainment provider for the Gala evening to support Down Syndrome Awareness that took place at the Renaissance By the Creek in Mississauga. At $100 per person, with the proceeds going to a worthy cause, the event was a big success including a silent auction, gourmet dinner, entertainment by Aaron Paterson and dancing. Aaron was honoured to have been a part of the evening performing a spectacular 1 hour show for the approximately 300 guests. 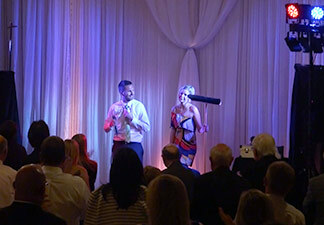 Guests showed their appreciation for the performance with a standing ovation. The Renaissance By The Creek staff were a pleasure to work with from start to finish and were instrumental in providing such a seamless evening. 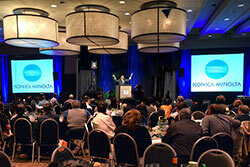 Aaron was able to supply DSAP with custom magic tricks for event participants, silk screened with the DSAP logo. An ideal souvenir for a magical evening. 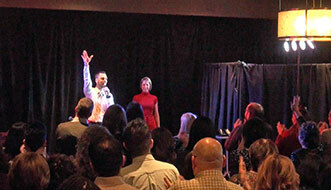 Aaron Paterson performs Corporate Entertainment in Hamilton, Ontario for the Tube-Mac Piping Technologies recent employee event and is given a standing ovation from the many guests in attendance. 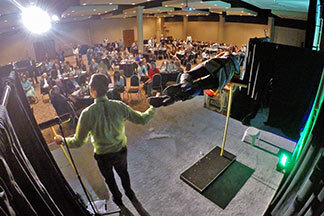 Comedy, Magic and Illusion were the highlight of the evening for the recent Tube Mac Piping Technologies employee event. The event took place at the lovely Winona Vine Estates where guests were treated to a delicious gourmet meal prior to the performance. Aaron took the stage at around 8:30 pm for a one hour performance and thrilled the large audience with a variety of the most popular pieces from his vast repertoire. As a result of the performance Aaron has been booked for various other upcoming dates at the venue and looks forward to returning to present his highly acclaimed performances. Winona Vine Estates went out of their way to ensure that the event flowed smoothly and did an impeccable job of providing a smooth evening for those in attendance. "Last night’s performance was great! The office is a buzz today, everyone is still in awe of all the acts. Thank you very much for making our party a great success."